Blockchain Technology and Its Potential Impact on the Business Ecosystems and Customer Experience. Blockchain was first introduced as the core technology behind Bitcoin, the headline-grabbing decentralized digital currency ecosystem proposed in 2008. The appeal of blockchain technology lies in its use of peer-to-peer network technology combined with cryptography, a digital ledger created to capture transactions conducted among various parties in a network. All participants, individuals or businesses using the shared database are “nodes” connected to the blockchain, each maintaining an identical copy of the ledger. Every entry into a blockchain is a transaction that represents an exchange of value between participants. In practice, many different types of blockchains are being developed and tested. However, most blockchains follow this general framework and approach (Lush, 2017). When one participant wants to send value to another, all the other nodes in the network communicate with each other using a pre-determined mechanism to check that the new transaction is valid. This mechanism is referred to as a consensus algorithm (Witherspoon, 2018). Once a transaction has been accepted by the network, all copies of the ledger are updated with the new information. 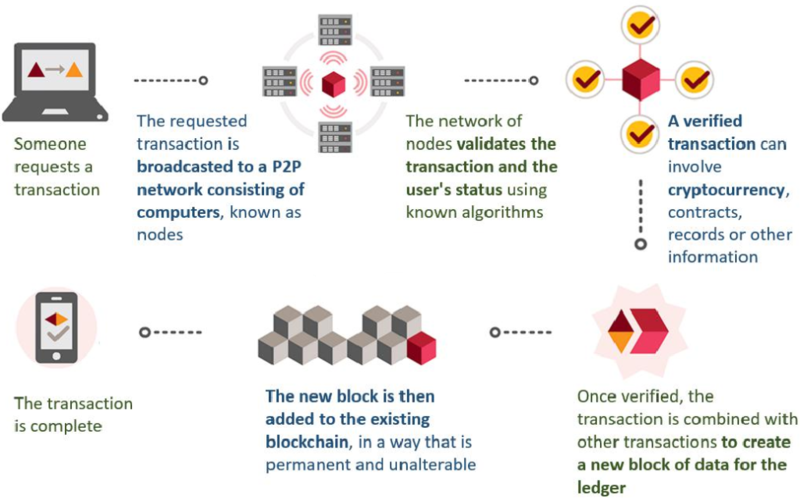 Multiple transactions are usually combined into a “block” that is added to the ledger (See Figure 1). Each block contains information that refers back to previous blocks and thus all blocks in the chain link together in the distributed identical copies. Participating nodes can add new, time-stamped transactions, but participants cannot delete or alter the entries once they have been validated and accepted by the network. If a node modified a previous block, it would not sync with the rest of the network and would be excluded from the blockchain. A properly functioning blockchain is thus immutable despite lacking a central administrator (Callahan, 2017). This combination enables parties who do not know each other to conduct transactions without requiring a traditional trusted intermediary such as a bank or payment processing network. By eliminating the intermediary and harnessing the power of peer-to-peer networks, blockchain technology may provide new opportunities to reduce transaction costs dramatically and decrease transaction settlement time (Lewrick, 2018). Blockchain has the potential to transform and disrupt a multitude of industries, from financial services to the public sector to healthcare. As a result, a number of venture capital firms and large enterprises are investing in blockchain technology research and trials to re-imagine traditional practices and business models (Jagati, 2018). A major advantage of blockchain technology is its distributed nature. In today’s capital markets, the transfer of value between two parties generally requires centralized transaction processors such as banks or credit card networks. These processors reduce counterparty risk for each party by serving as an intermediary but centralize credit risks with themselves (D’Aliessi, 2016). Each of these centralized processors maintains its own separate ledger; the transacting parties rely on these processors to execute transactions accurately and securely. For providing this service, the transaction processors receive a fee. In contrast, a blockchain allows parties to transact directly with each other through a single distributed ledger, thus eliminating one of the needs for centralized transaction processors (Agrawal, 2018). 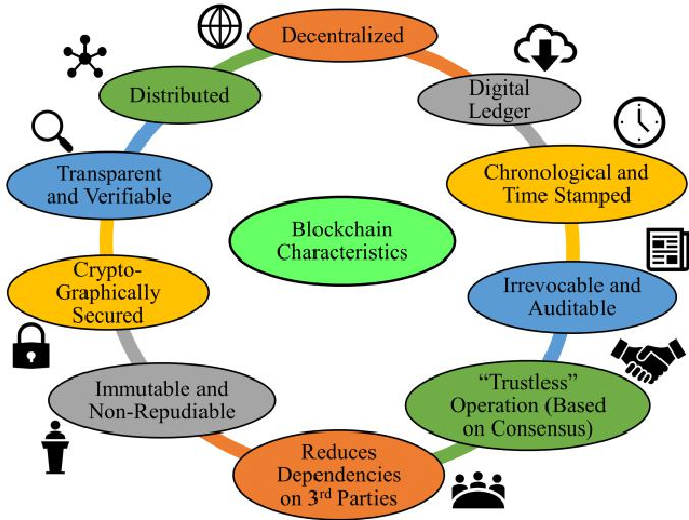 In addition to being efficient, the blockchain has other unique characteristics that make it a breakthrough innovation (See Figure 2). Blockchain is considered reliable because full copies of the blockchain ledger are maintained by all active nodes. Thus, if one node goes offline, the ledger is still readily available to all other participants in the network (Bhatia, 2017). A blockchain lacks a single point of failure. In addition, each block in the chain refers to the previous blocks, which prevents deletion or reversing transactions once they are appended to the blockchain. Nodes on a blockchain network can come and go but the network integrity and reliability will remain intact as long as it is being used. In this way, no single party controls a blockchain and no single party can modify it or turn it off (Chapman, 2018). People should be aware that blockchain technology is a new form of database and each blockchain implementation may have different characteristics that make it unique. While the technology is emerging, there is a risk that a specific blockchain implementation does not live up to the promise of the technology. In the current ecosystem, there are two major classifications of blockchain networks: permissionless and permissioned (De Breuck, 2017). The biggest difference is the determination of which parties are allowed access to the network. A blockchain may be shared publicly with anyone who has access to the Internet; permissionless or public blockchain or shared with only certain participants; permissioned or private blockchain (Kadyala, 2018). So what is the difference between permissionless and permissioned blockchain? A permissionless blockchain is open to any potential user. For example, the Bitcoin blockchain is a public or permissionless blockchain; anyone can participate as a node in the chain by agreeing to relay and validate transactions on the network thereby offering their computer processor as a node (Kadiyala, 2018). Joining the blockchain is as simple as downloading the software and bitcoin ledger from the Internet. Because the blockchain maintains a list of every transaction ever performed, it reflects the full transaction history and account balances of all parties (Kadiyala, 2018). 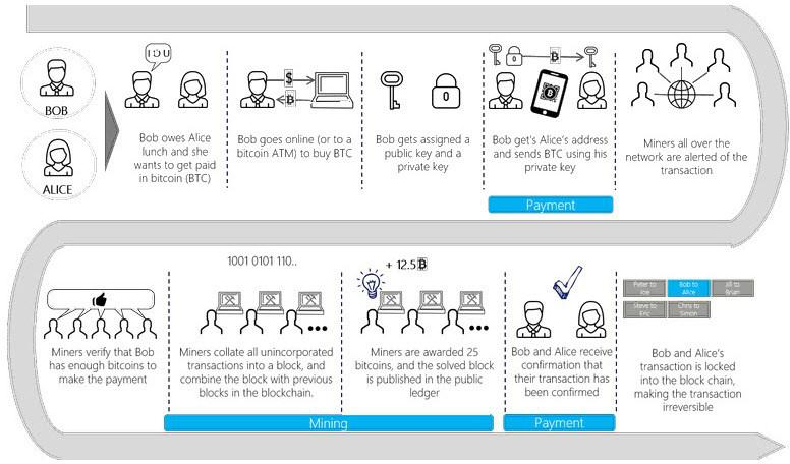 Figure 3 is an example of a transfer of bitcoin (BTC) from one individual to another. When one party sends bitcoin to another party, the Bitcoin blockchain is updated by the following process, including a process referred to as “mining”. While a permissionless blockchain lives up to the potential of the technology by allowing anyone access, it can have limitations that are difficult to remedy. For example, when the blockchain is created, transaction volume or size may be set to the best available technology at the time. As technology advances, initial settings may become limitations that may make the blockchain out of date, potentially slowing transaction speeds (Dreifuerst, 2018). Users of permissionless blockchains should also be aware that their transaction history is exposed to anyone who downloads the database for as long as the database is active. While it may be difficult for an outside party to identify a participant on the blockchain, if a participant is identified, their entire transaction history would be public (Dreifuerst, 2018). The limitations of permissionless blockchains have led some organizations to explore the use of private or permissioned/consortium blockchains, which restrict participation in the blockchain network to participants who have already been given permission by agreed-upon administrators. These blockchains address some of the drawbacks of public blockchains, but also sacrifice some of the potential benefits (See Figure 4). Permissioned blockchains are likely to be set up by a consortium of parties that can collectively benefit from a shared ledger system (Allaby, 2016). For example, a supply chain network may want to use a blockchain to track the movement of goods. Given the widely acknowledged limitations inherent in public blockchains, private or permissioned/consortium blockchains are expected to have a higher adoption rate in the near term, especially in enterprise environments. However, adoption of public blockchains is also expected to increase in the longer term once the key infrastructure and technical challenges of the new technology have been addressed (Kulkarni, 2018). The paradigm shift introduced by blockchain in many ways parallels the development of the Internet in the 1990s. With Internet technology, there was a strong initial emphasis on corporate intranets until a critical mass was reached and the broader public Internet began to offer more benefits to offset the perceived risks of participating in an open network (Jayachandran, 2017). Another key development in blockchain technology was the introduction of smart contracts. Smart contracts are computer code stored on a blockchain that executes actions under specified circumstances. They enable counterparties to automate tasks usually performed manually through a third-party intermediary. Smart-contract technology can speed up business processes, reduce operational error, and improve cost efficiency (Chatsko, 2018). For example, two parties could use a smart contract to enter into a common derivative contract to hedge the price of oil at the end of the year. Once the terms of the contract have been agreed to, it is appended to the blockchain and the wagered funds are held in escrow and registered on a blockchain. At year end, the smart contract would read the price of oil by referencing a trusted source defined in the smart contract, calculate the settlement amount, and then transfer funds to the winning party on the blockchain (Chatsko, 2018). 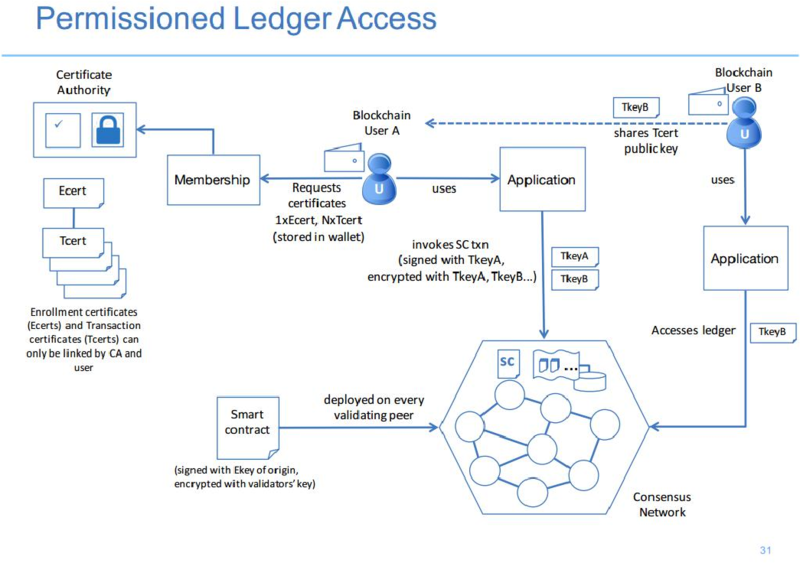 Smart contracts are a method to automate the contracting process and enable monitoring and enforcement of contractual promises with minimal human intervention (See Figure 5). Automation can improve efficiency, reduce settlement times and operational errors. Because using smart contract technology requires the translation of all contractual terms into logic, it may also improve contract compliance by reducing ambiguity in certain situations (Chandrayan 2017). As smart contracts continue to evolve, inherent risks may emerge that need to be mitigated. For example, when setting up a smart contract, the parties may decide not to address every possible outcome, or they may include some level of flexibility so they do not limit themselves. This could lead to smart contracts with vulnerabilities or errors that could lead to unexpected business outcomes. Parties may find it difficult to renegotiate the terms of a deal or modify terms due to an unforeseen error. Also, incomplete or flexible contracts can lead to settlement problems and disputes. Perhaps most importantly, however, at the date of this publication, smart contracts have not been tested thoroughly in the court system. Nevertheless, smart contracts offer a compelling use case for blockchain adoption (Mack, 2018). So what does Blockchain technology have to do with customer experience? The fundamentals of customer experience are rooted in the trust that a customer places in a brand. Trust that an organization will be true to its word, live up to its brand promises, provide the product or service as specified and not let the customer down. According to The Harris Poll Reputation Quotient, the top four factors that negatively impact corporate reputation are; lying or misrepresenting facts about a product or service (80% of Americans interviewed), intentional wrongdoing or illegal actions by corporate leaders (again 80% of those surveyed), security or data breaches (74%), and product recalls due to contamination that may cause illness (66%). Since the fundamental benefits of blockchain’s digital ledger technology are trust and transparency, the technology logically has enormous potential to transform customer experience. Here are four reasons why it is transformative for customer experience; (a) The technology enables peer to peer transactions without the need of a trusted central third party or intermediary, meaning brands can interact directly with customers and have greater level of influence over the customer journey. (b) Cryptography enables increased security and protection of data and identity, meaning customers can own and monetize their own data leading which will lead to a re-imagination of customer loyalty programs. (c) Data is immutable thus reducing fraud, increasing transparency, meaning the provenance of an asset, a claim about a brand, or company performance is indisputable. This could include NPS scores, customer retention rates and product defect rates. (d) Near real-time settlement means friction in a transaction is eliminated and risk reduced. As more customers interact with blockchain applications, the bar of customer expectations for an effortless experience will be raised (Nuttall, 2017). Companies that adopt this technology will be transparent, not hiding behind obscure contract terms and conditions, and will build trust, for example by overhauling outdated loyalty programs to build unique, traceable customer rewards. Blockchain is therefore a big deal for customer experience professionals enabling organizations to build propositions that create genuine value and long term loyalty for customers (Carrigan, 2018). Blockchain changes the information and technology paradigm for processing and has the potential to re-invent the model for managing transaction-processing contracts. This core innovation is one that extends across several industry segments delivering operational value through improved efficiency (See Figure 6). By reordering and automating complex labor-intensive processes, Blockchain can enable organizations to operate faster while at the same time reducing cost and friction (Owyang, 2017). The value proposition of Blockchain resonates with industries and applications that have key performance drivers related to cost reduction and process efficiencies. These include healthcare and supply chain management. Financial services and industries have evolved into a highly complex but orchestrated marketplace. The advent of Blockchain requires an ecosystem that collaborates across industries, geographies, borders and boundaries (Owyang, 2017). While today’s market infrastructure and approach is mostly efficient and stable, we have the opportunity to develop a stronger ecosystem with built in irrefutability and scalability which allows for an industry-led re-architecture of processes and systems. It will take work but the payoff will result in a more efficient business environment with macro-level impacts to economies (Nuttall, 2017). Blockchain is certainly going to change the way we do things. In the beginning, as was the case with the introduction of the internet in the 90s, change will be slow before it snowballs and completely overshadow everything we know. The same way, blockchain technologies are here to define our future. Today most people who use the internet and the underlying technologies do not understand how it works but use it for everything from shopping to healthcare to daily communication in ways which were not possible before. Blockchain can once again drastically change our society and understanding on how it can affect our lives today, which will help us prepare and benefit from the future changes to come. Blockchain is the technology of the future. One of the most attractive things about blockchain is its inbuilt security and also the decentralization and disintermediation of systems/information it offers. Blockchain can be applied virtually to any industry when databases of transactions, balances, trades are being kept and maintained. Blockchain will wrest control from institutions and governments and give it to the people directly involved. There will come a time that blockchain will be so intrinsic to the way things are done that it will be taken for granted. In the next two to five years, we are going to see projects that use the blockchain without even mentioning it because it is going to be used for the infrastructure of these new businesses. If you are interested in Blockchain technology and would like to invest in Zaytech please e-mail [email protected] for more information. We are looking for investors and can share with you our current work. Agrawal, J. (2018, Jan. 18th). Benefits of Blcokchain to Industries Beyond Cryptocurrency. Allaby, D. (2016, Oct. 27th). The Trust Trade-Off Permissioned VS. Permissionless Blockchains. Bhatia, M. (2017, Dec. 6th). Improving CX: The What and How of Blockchain Technology. Callahan, M. (2017, Apr. 19th). The Potential Marketing Application Of Bitcoin And Blockchain. Carrigan, Tim. (2018, Feb. 14th). How Blockchain is Shaping Customer Experience. Chandrayan, P. (2017, Aug. 30th). Blockchain Technology: Smart Contract Fundamentals. Chapman, K. (2018, Apr. 23rd). How Blockchain Could Transform The Customer Experience. Chatsko, M. (2018, Mar. 9th). Smart Contracts and the Blockchain Explained. D’Aliessi, M. (2016, Jun. 1st). How does the Blockchain work? De Breuck, F. (2017, Nov. 13th). How to Master the Relevancy of Permissioned vs. Permissionless Blockchain and Distributed Ledger Technology? Jayachandra, P. (2017, May 31st). The Difference Between Public and Private Blockchain. Kadiyala, A. (2018, Feb. 17th). Nuances Between Permissionless and Permissioned Blockchains. Kulkarni, A. (2018, Jan. 25th). How To Choose Between Public And Permissioned Blockchain For Your Project. Lewrick, M. (2018, May 8th). Blockchain and Business Ecosystem Design. Lush, E. (2017, May 27th). Blockchain: An Investor’s Guide. Mack, O. (2018, May 14th). Smart Contracts: The Future of Contracts, Brought To You ByBlockchain. Nuttall, S. (2017, Nov. 16th). Why Blockchain Technology Will Transform Customer Experience. Owyang, J. (2017, Jul. 11th). 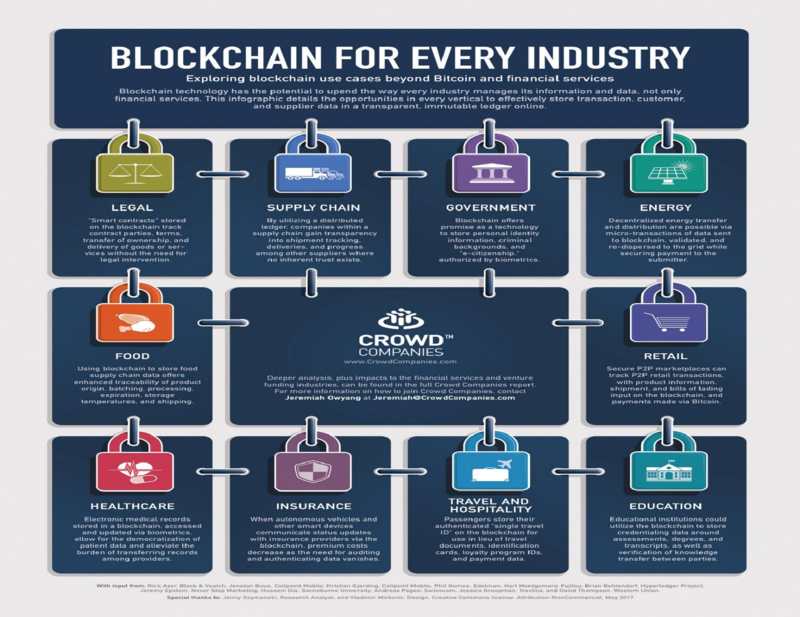 Graphic: Blockchain for Every Industry. The Harris Poll; The Reputations Of The Most Visible Companies. Witherspoon, Zane. (2018, Feb. 13th). A Hitchliker’s Guide to Consensus Algorithms.